Get the full TubeCube | 7 experience with this kit. Featuring our renown TubeCube | 7 Vacuum Tube Amplifier, this kit comes complete with everything you need to get an audiophile quality, vacuum tube experience. 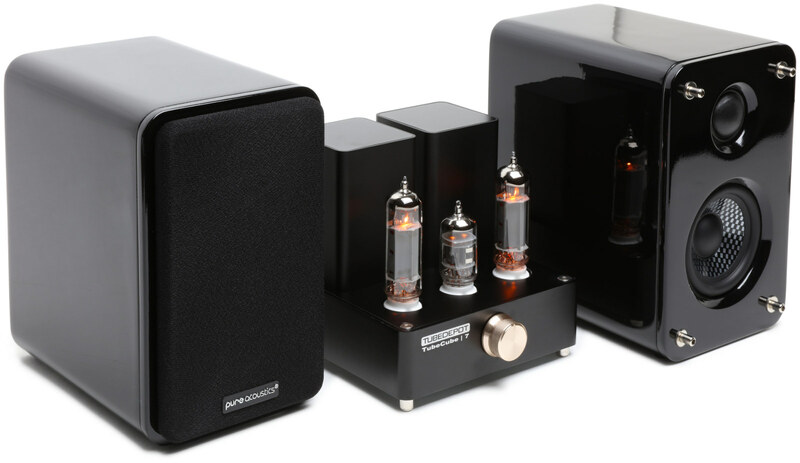 Coupled with a pair of the beautiful black Dreambox speakers, this set is the perfect combination for your desktop, bookshelf or any place you want the desirable look and sound of vacuum tube audio. This little bundle truly exceeds expectations for my home office desk setup. My reference point 'big-rig' is gear stuffed with NOS tubes and full range speakers. The Tube Cube/ DB rig (fed by Tidal Hi-Fi and Modi Uber DAC) is musical and believable. Sure, rolled off LF--but done right. Soundstage is deep-the speakers disappear. Grittiness and image smear are banished. There is one problem though--my eyes closed listening moments are increasingly cutting in to my work. You are warned! I love this little amp & speaker kit and have enjoyed it daily at my office desk. For fun, I’ve rolled several expensive NOS tubes and found great improvement over the stock tubes, however to my surprise this amp seems to love Electro-Harmonix 12AY7 EH / 6072A in place of the 12AX7a. For me the Electro-Harmonix 12AY7 EH seem to boosts the highs to compensate for the 3db dip that this amp is known for. I’m very happy with the TubeCube | 7 - Dreambox HiFi Set! My TubeCube 7 system arrived today safely. Great secure packaging! I have it hooked up to my computer, with the amp sitting on top of the cabinet. Very clean audio, with absolutely no hum. The volume is more than adequate. I do notice that the amplifier chassis runs pretty warm. I grew up with tubes, being a ham radio operator, so it’s nice to have that warm filament glow again! This is my third order from Tube Depot and I know it won’t be the last. I just received my Tube Cube Seven & Dreambox Speakers. What a combination. I have two other tube amps that cost more and this surpasses them. What a pleasant surprise, I have replaced a system in my bedroom with this system, I plan to order another amp & speaker combo soon. And as usual the order was delivered promptly and packaged securely. Thank You everyone at Tube Depot! Since I received the new amp I use it everyday before bed and again in the morning for a short while. I think it is a very nice set, more than worth the money. I am especially impressed with the responsiveness of the speakers. They allow the user to take full advantage of the EL-84 power tubes and I have been able to explore the extreme limit of just how small an output I can get and still have excellent clarity. I am impressed everyday, and wonder when I will finally accept, and even take for granted, what a good job someone did designing this little gem. I suspect it couldn’t be done without the 12ax7 tube. Jolida uses these tubes very successfully, as does Bluetube. I didn’t even know one tube could supply two channels. I am very impressed and am considering buying a couple additional sets for gifts.